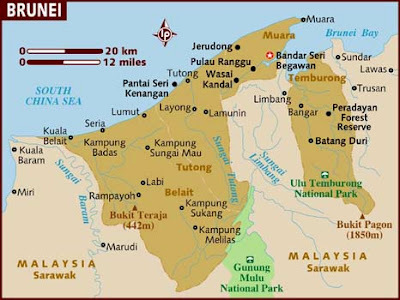 Brunei is a nation located on the island of Borneo – an island which also contains territory of Indonesia and Malaysia. Brunei has extensive access to the South China Sea. However, it is divided in its territory by a portion of Malaysia called the Limbang Corridor. Brunei was a British protectorate until 1984, which ended nearly 100 years of British control of the nation. Following independence, Brunei gained its place as a member state of the United Nations. The government system in Brunei is that of a constitutional sultanate (locally known as Malay Islamic Monarchy) and is dominated by a family which has controlled the country for the past six centuries. Islam plays a huge role in religion. In fact, according to the World Factbook, the legal system is a “mixed legal system based on English common law and Islamic law.” However, about 67% of the Bruneians say that they are adherents to the Muslim faith. The Sultan is the head of the Islamic faith in the country. Brunei is only home to about 415,000 individuals. There is some degree of ethnic diversity, just as the other nations in the region. Ethnic Malay make up around 66% of the population; ethnic Chinese make up 11.2%; and other ethnicities (including indigenous peoples) make up the rest in smaller percentages. The official language is Malay, but English is used extensively in business, due to the history of British colonization. The rich deposits of crude oil and natural gas make Brunei the fifth richest country in the world (based on a measuring system that adjusts GDP for purchasing power parity), according to a 2012 report by Forbes Magazine. In short, many academics have speculated that a rise in education level often leads to a rise in democratic participation. As this clearly has not been the case in Brunei, the author offers an introduction to the linguistic traditions of the country (which is very much based on colonial power and rule), as well as the recent rise of literacy and education in a political context. I will note that I found this to be a very technical book – and at times, a bit hard to digest due to my lack of knowledge about the country of Brunei. For those with a particular interest in the country or a research interest in language and its impact on a government structure, as well as on the development of a national identity, I would recommend this book. In order to understand how this could occur, I found a couple of points of particular interest. Throughout the nation’s history, there have been foreign influences at play, but interestingly the ruling family has been able to use these influences to consolidate power, rather than erode power. 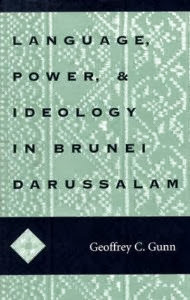 The sultan acts as the head of Islam for the entire country and unlike many other Southeast Asian countries “where religion became a focal point for political expression,… no Islamic-based political organization took root in Brunei, nor did religion take on political overtones outside of state patronage.” (page 215) Likewise, the ruling family was able to survive and thrive during British colonial rule, allowing the British to create an English-language-educated elite that is now able to assist in the development process. Equally important to mention is that the state has a monopoly over the country’s media – a tradition started in British colonial times.